People attend a protest outside National Police police station, in Barcelona, Spain Oct. 2, 2017. Hundreds of people took to the streets in Barcelona to protest a police crackdown in Catalonia to stop an independence referendum in the region. Protestors, many of them students, waved the Catalan independence flag Monday and held up signs demanding more democracy outside the headquarters of the Spanish police in Barcelona. Demonstrations also took place in several other Catalan cities, including Girona and Lleida. The violence followed a police crackdown during Sunday's independence referendum. Officials in Catalonia said nearly 900 people were injured when police tried to keep residents from voting in the referendum, deemed unconstitutional by the Spanish courts. In this Oct. 1, 2017 photo, a Spanish riot police swings a club against would-be voters near a school assigned to be a polling station by the Catalan government in Barcelona, Spain. Video from Sunday showed police dragging people from polling stations and beating and kicking would-be voters and demonstrators. 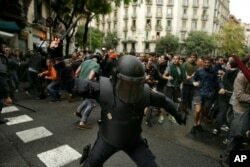 Spain's Interior Ministry said Monday that more than 430 National Police and Civil Guard agents suffered injuries from the clashes. Amnesty International says its observers witnessed “excessive use of force” by Spanish police. 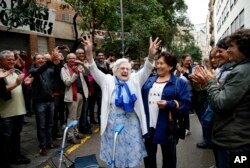 In this Oct. 1, 2017 photo, an elderly lady is applauded as she celebrates after voting at a school assigned to be a polling station in Barcelona, Spain. EU chief Donald Tusk appealed to Spanish Prime Minister Mariano Rajov on Monday to “avoid further escalation and use of force” in the standoff.